7 Kids and Us: Star Wars Stormtrooper Toaster and a Shopkins Waffle Maker! Star Wars Stormtrooper Toaster and a Shopkins Waffle Maker! The kids and I usually eat breakfast in the car on the way to our co-op. We just don't do early mornings (home school, yay!) and getting out the door is hard enough without having to sit down and have breakfast. Sometimes, I have a hard time getting the kids to eat, because they just are not hungry in the mornings. The day I got this Stormtrooper Toaster to try out, was the day that all changed! 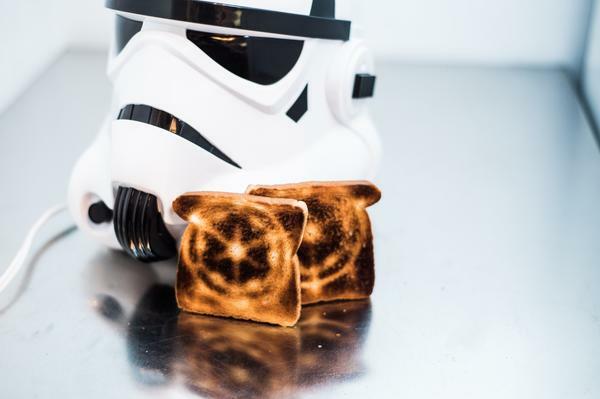 Every morning my kids are now asking me for stormtrooper toast. It's so fun, and easy to make! Behold the Buckethead! Make way for the shock troopers of the Imperial Army. 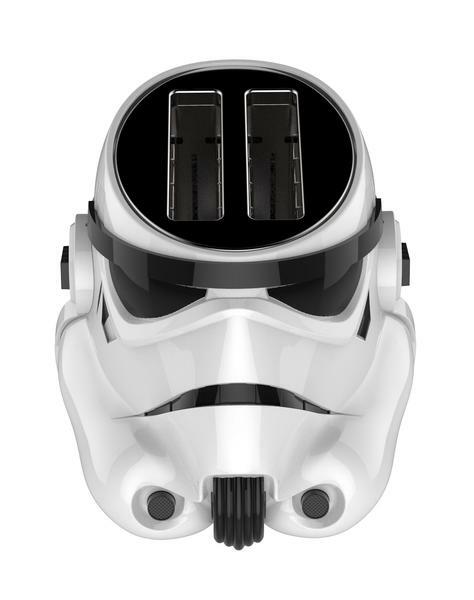 Molded in sturdy white plastic and meticulously detailed, the Stormtrooper Toaster will make a striking addition to your assortment of kitchen electrics. Pop in two pieces of bread, toaster pastries, hamburger buns or English muffins, and in moments it is ejected with the Galactic Empire logo toasted right on them. Like your toast on the darker side? A handy dial provides temperature adjustment. Measuring a hefty 12" X 10" X 8.5" and weighing in at 4.1 lbs. of mystery and menace, the imposing presence of Stormtrooper will help eaters start their day feeling they too are the keenest weapon in the Emperors arsenal! You can purchase the Star Wars Stormtrooper Toaster made by Panega Brands on Amazon.com or here. Who doesn't love waffles? I don't know anyone! 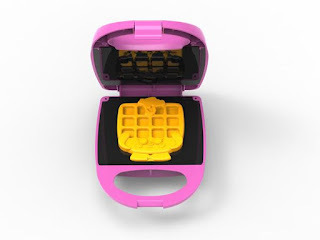 My kids especially love the waffles that come in different fun shapes, and the new waffle maker from Panega Brands is no exception! We flipped out when we saw how cute these waffles are! The Shopkins Mini Waffle Maker is a great addition to your breakfast fun! 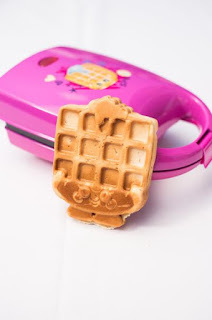 Make delicious mini Waffle Sue waffles in a blink with the Shopkins mini waffle maker. Waffles are more fun with your favorite topping, syrup or chocolate for a sweet treat. Nonstick coating makes cleanup easy. The waffle maker features 510 watts of power and ready light, convenient cord wrap and latching handle. You can purchase the Shopkins Mini Waffle Maker on Amazon.com or here.